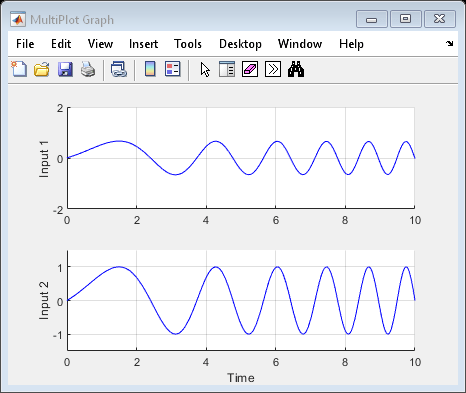 This example shows how to use Simulink® blocks and helper functions provided by Robust Control Toolbox™ to specify and analyze uncertain systems in Simulink and how to use these tools to perform Monte Carlo simulations of uncertain systems. Unmodeled dynamics which amount to 25% relative uncertainty at low frequency rising to 100% uncertainty at 130 rad/s. 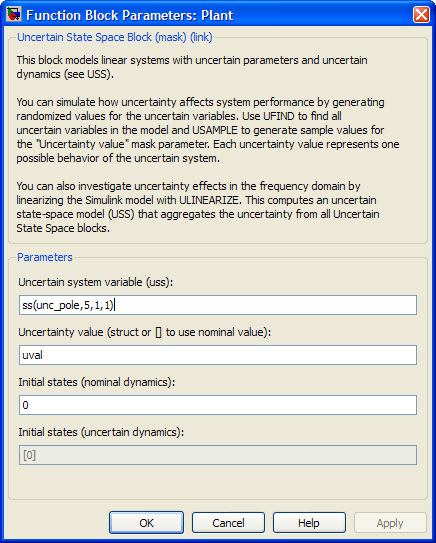 The Uncertain State Space block lets you specify uncertain linear systems (USS objects). 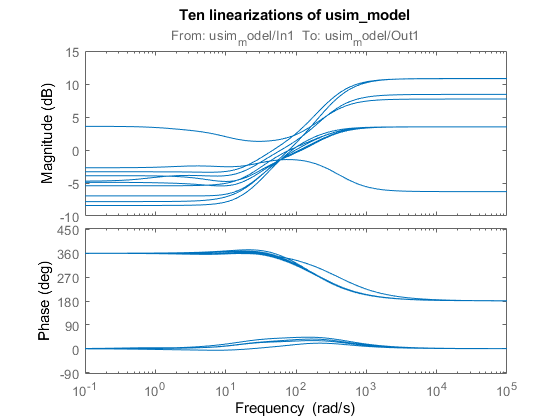 usim_model contains three such blocks which are highlighted in blue. The dialog for the "Plant" block appears below. 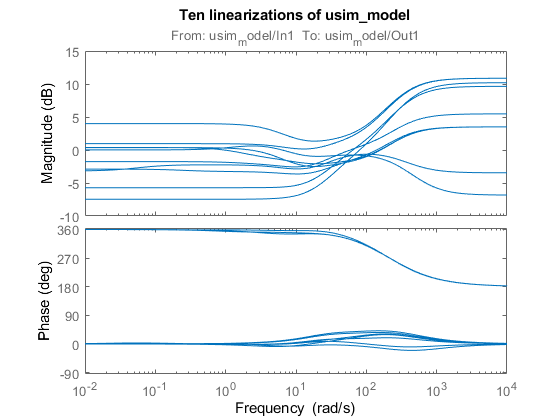 The "Uncertain system variable" parameter specifies the uncertain plant model (first-order model with uncertain pole unc_pole). The "Uncertainty value" parameter specifies values for the block's uncertain variables (unc_pole in this case). uval is a structure whose field names and values are the uncertain variable names and values to use for simulation. You can set uval to  to use nominal values for the uncertain variables or vary uval to analyze how uncertainty affects the model responses. 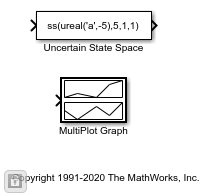 The MultiPlot Graph block is a convenient way to visualize the response spread as you vary the uncertainty. This block superposes the simulation results obtained for each uncertainty value. 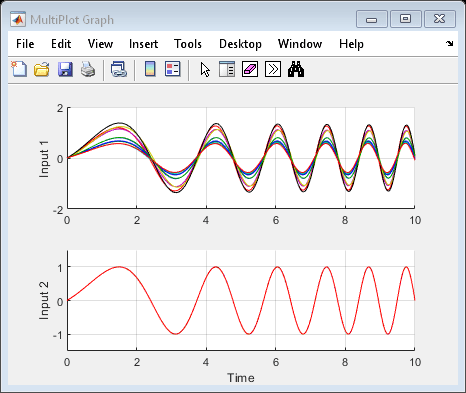 Again the MultiPlot Graph window shows 10 possible responses of the uncertain feedback loop. 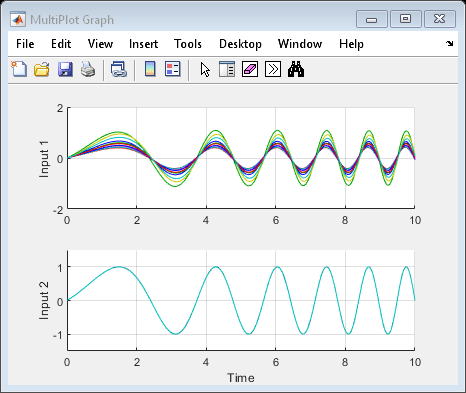 Uncertain continuous-time state-space model with 1 outputs, 1 inputs, 3 states. Type "usys.NominalValue" to see the nominal value, "get(usys)" to see all properties, and "usys.Uncertainty" to interact with the uncertain elements.